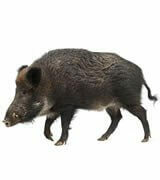 Wild pigs, wild hogs, wild boar, feral pigs as they are commonly known in the state of Florida are not a native animal species. They are believed to have been introduced into Florida as early as the 1500s by Spanish explorers. Critter Control in Southwest Florida knows the damage these animals can cause. We have over 30 years of experience dealing with all sorts of animal control and removal. Wild hogs are incredibly dangerous, destructive, and difficult to manage. Due to their aggressive and destructive nature, it’s best to handle them quickly and efficiently before they can destroy land or hurt anyone.